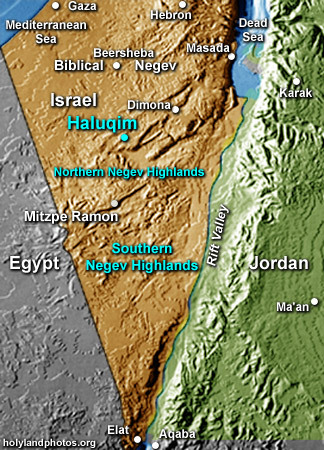 Haluqim is a small Iron II site that is located about 32 mi. [53 km.] due south of Beersheba and just a bit north of Sede Boqer. During the Israelite Period (1000–586 B.C.) it consisted of a small oval fortress that guarded the trade route that ran from the Rift Valley to Gaza. In addition to the fort there are a number of four–unit/room houses that the stationed troops lived in as well as dams in the nearby wadis that collected runoff water. The area is quite arid—receiving only 2-4 inches [5–10 cm.] of rain every year. This site is one of about forty that were built during the Solomonic era in order to control the incense trade route that ran from southern Arabia to Gaza. The troops that were stationed in these small forts monitored the caravans traveling through this area. They collected tariffs and tolls and provided food, water, and protection to the caravans.